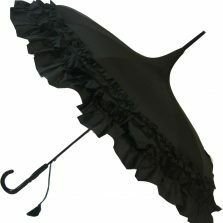 This delightful black Princess pagoda umbrella will be the perfect accessory whatever the occasion. 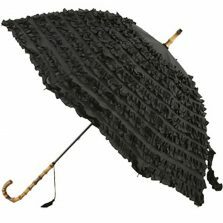 This beautiful pagoda umbrella is so exquisite our photo really does not do it justice. To buy it is to love it. This beautiful pagoda umbrella is perfect for so many situations: Weddings, Funerals, Garden Parties, Christenings, Bar/Bat Mitzvah… Well any occasion really. 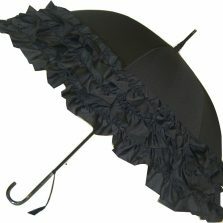 Here at Umbrella Heaven we like to think of umbrellas as accessories, as important as shoes, handbags and hats. When you have spent money, time and effort in putting together the perfect outfit for a special occasion you will not want it spoilt by the rain. If you have the perfect umbrella however, not only will it protect you from the rain but it will keep your special outfit dry and at the same time make you look a whole lot smarter than others who may not be so well prepared as yourself! The beautiful pagoda shape features contrasting piping on it’s 16 ribs in a polka dot design. When open the canopy is 89 cm wide and the overall length is 86 cm. 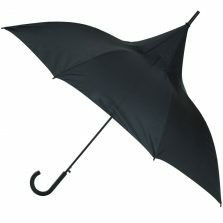 It’s a manual opening umbrella and has a smart (very sophisticated) leatherette crooked handle to finish it off. 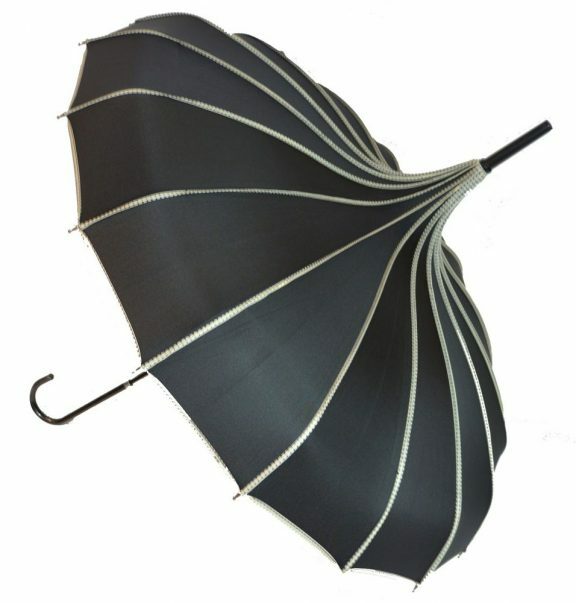 This really is a very special pagoda umbrella at an incredible price and is sure to raise some eyebrows on an otherwise dark and dreary day! Not the one for you? Check out the rest of our pagoda umbrellas!